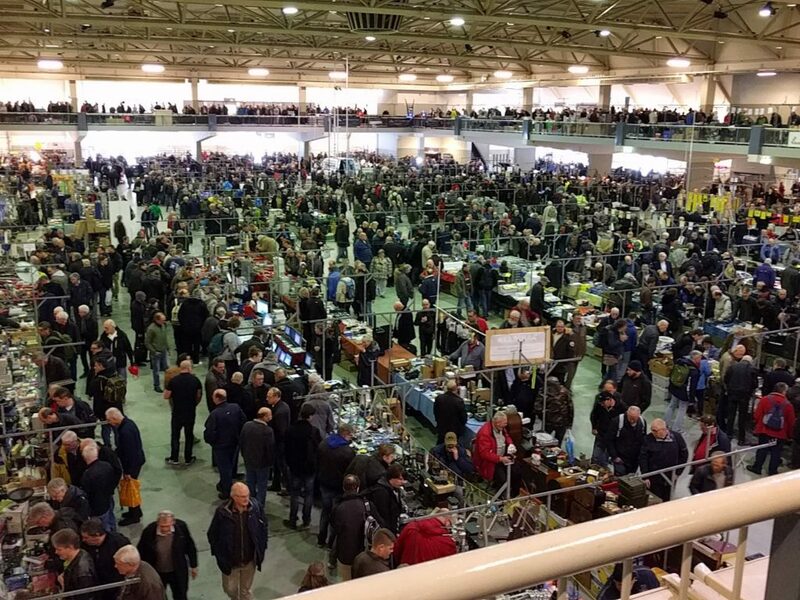 This weekend saw a large group (17 of us) from the Camb-Hams and various friends going to the Dutch national radio flea market at Rosmalen in central Holland. I haven’t been for four years, but this is always a great event. Visitor numbers were notably down this year, and a few of the usual traders weren’t there either. There was also a lot more vintage and military radios than we remembered in the past (if you were a set designer kitting out a 1950s house for a period TV drama, you’d have had a field day!) and a little less test gear, but there were still purchases to be made! Personally, my main purchase was a 3-element HB9CV antenna for 2m, which I’m planning to compare against the SOTA Beam for hilltop use. It’s nice and lightweight, and packs down small, if a little fragile. For people in the east of England, this is a really easy event to get to. We take the overnight ferry from Harwich after work on the Friday evening (having breakfast on board on Saturday morning). You can then drive from Hook of Holland to the Autotron within just a little over an hour, arriving only shortly after the event has opened. The return journey is also an overnight crossing, arriving at breakfast time on the Sunday, so no hotels are required. As we had a little time to kill before our return crossing, a few of us headed to Goeree Overflakkee, an island just around the coast from Hook of Holland. The island counts for EU-146 for IOTA but it is an island you can easily drive onto. Some of the group – not including myself – operated in the RDXC contest from the beach just outside the village of Ouddorp, just down the road from a certain military radio establishment. Dan PA/M0WUT operating CW in the Russian DX Contest, parked at the beach while waiting for the ferry. The only other thing to mention is the weather. We didn’t have any problems caused by it but it was bitterly cold with short snow flurries and ground temperatures of -3c (colder with wind chill). There was even ice on the shoreline at Ouddorp. The snow was being brought in by some very keen easterly winds but amazingly this didn’t cause a significant swell for our return crossing. March 18, 2018 in Amateur Radio.